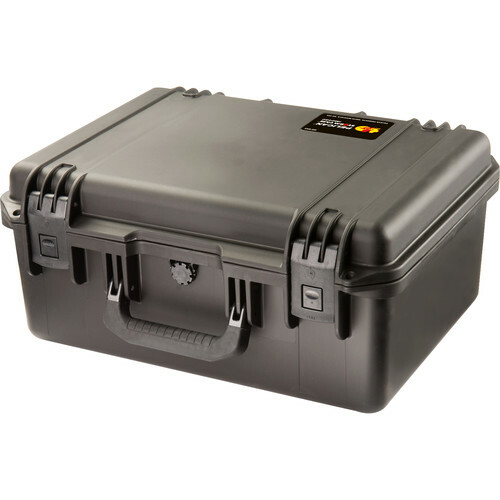 The Pelican iM2450 Storm Case without Foam (Black) is an injection-molded case made of HPX high performance resin, that is virtually unbreakable, dent-resistant and shatter-resistant. It is tough, rugged, lightweight, airtight and watertight. There is a permanently attached Vortex valve that automatically adjusts air pressure without letting in water, and won't unscrew from the case. Press & Pull latches open with the push of a button, yet stay closed securely under impact or stress. The case has unbreakable molded-in hasps that allow the addition of standard size padlocks. It has hinges with integrated feet that hold fast under impact, and create a flat surface for upright stability. It is carried by a double-layered, soft-grip, solid-core handle that provides strong, durable comfort. Box Dimensions (LxWxH) 19.8 x 16.0 x 9.3"
iM2450 Storm Case without Foam (Black) is rated 4.7 out of 5 by 10. Rated 4 out of 5 by Anonymous from Not exactly 13 inch width Excellent case for the price. Unfortunately I have to return mine because the interior size is off spec. With these resin cases there is some distortion as the centers will sometimes slightly bow in. The length is actually as stated, 18 inside or slightly more at the top, but the width of mine is about 12 7/8 or 32.6 cm. One of the items I wanted the case to hold is a 13x14 sheet of glass, and it won't fit without routing the plastic and possibly destroying the seal. So I have to bump up to the iM2600 case. This mistake is not a B&H typo, the inaccurate 13 size is also quoted on the manufacturer's site. Rated 4 out of 5 by dtb2266 from storm case everything is great, it wasn't as thick as i thought it would be, but all in all it is a great box. i am using it as a top pannier on a bmw 1200 gs, works great. Rated 5 out of 5 by fettler from The case is solved I use these on Adventure motorcycles I modify. They are spacious, solid and great value. Nothing else compares at the price and I have tried many. I do wish they had a TOP opening version, if you mount this on the side of your bike the stuff falls out when you open it. Rated 5 out of 5 by quizkiwi from Excellent Execution The design of these cases are so solid. From the hinge, to the latches, to the handle. You can tell this thing was designed to take a beating and keep on going. I wish it was possible to lock with just one padlock, but I understand that functionally, locking a plastic case in two places is necessary. I had some custom foam built for holding two-way radios and it is a real clean implementation. Rated 5 out of 5 by John from Top quality as usual Bought this to use as a meds lockbox. After trying many others that first worked OK but eventually failed, this was just right. Meds and paperwork fit in fine and using a separate lock was a smart thing to do in case it fails. (Previous boxes had integral locks and they ALL failed!). But I know the box itself will never fail. Pelicans are no-brainers. Rated 5 out of 5 by Michael from Perfect Lens Case What more can I say, this makes a great, durable lens case to house my expensive glass. I chose to get custom laser cut inserts and they fit perfectly. You can lock these too for extra sercurity whilst traveling. However, if you're looking for something light (and weak), this is not for you. Rated 5 out of 5 by alejocaho from Nice cases It's been some days since I purchased the cases and they are as I spected, rugged an really well builded. Rated 4 out of 5 by Carlos B. from Excelent It's my first Pelican case but I'm sure that not the last one. I'm thinking to buy another one. What is the inside height of the iM2450 lower case from bottom to first edge please? Thank you!